You can now access the annual meeting and the district's parent involvement plan online! Nearly 1000 @ the BASH! The Colleton County School District Title I Parent Involvement Program would like to thank Eat Smart Move More Colleton, Colleton County Middle School, and the parents and students of Colleton County for making the 1st annual Parent Field Day a success! LOOK AT PICTURES HERE! Want more info on new ways parents and schools can get a good workout in the day? Eat Smart, Move More Colleton County! Want to know what the Parent Involvement Program is doing? Here is our portion of the Title I Annual Report! We are making the rounds of all the Title I schools, we've have excellent turnout and participation at: BELLS, BLACKSTREET, COTTAGEVILLE, COLLETON COUNTY MIDDLE, HENDERSONVILLE, FOREST HILLS, and NORTHSIDE. The Back 2 School Bash was a lot of fun! 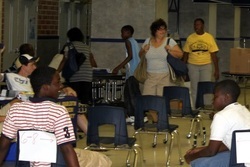 The Colleton County School District Title I Parent Involvement Program would like to thank the Colleton County Sheriff’s Department, Colleton County Middle School, and the parents and students of Colleton County for making the 4th annual Back to School Bash a success! 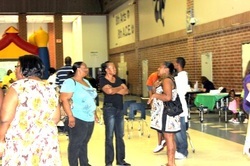 Due to the extreme heat, the Bash was moved indoors from the track to the Commons Area of the Middle School. Several hundred Colleton County residents attended the Back to School Bash and received school supplies, ate hot dogs, and jumped for joy in the jump castle. Despite the difficult economic situation in the nation, the event was supported by many businesses AND organizations within the local community. For more information, or to support next year’s Back to School Bash, please contact Officer Wiggins through the Colleton County Sheriff’s Department or Shelby Simmons the Parent Involvement Coordinator with the Colleton County School District at 843-782-4522 x 40253.